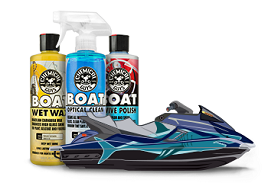 The Chemical Guys Starter Car Care Kit combines all the products professionals always reach for to keep the most precious cars looking and feeling their very best. 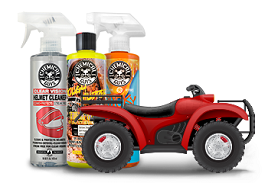 The Starter Car Care Kit is the perfect combination of products to get any first-timer starter! Always start by washing the entire car and wheels with Citrus Wash & Gloss car wash shampoo and Signature Series Wheel Cleaner. 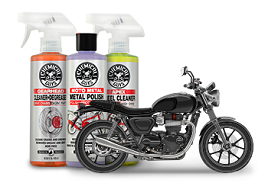 Once the car is clean and free of any loose dirt and debris, remove embedded impurities and contaminants from painted surfaces with the Light Duty Clay Bar and Speed Wipe Detail Spray for a smooth-as-glass feel on paint, metal, glass, and optical plastic. Shine and protect paint, metal, and glass against pollution, UV sunlight, birds, and bugs with a good coat of Butter Wet Wax. Restore that just-waxed look with Speed Wipe Quick Detail Spray to remove fingerprints, bird droppings, and light dirt in between full washes. Make tires and bumpers look deep black and brand new with a crisp coating of Silk Shine dressing. Easy to apply, dry to the touch and can be used on the interior and exterior vinyl, rubber and plastics of your car.